Baked Club Sandwiches is one of those recipes that I use as a go to for entertaining or when I want something easy during the week. This recipe comes together easily and is always a hit with adults and kids alike! As Football season is quickly approaching, be sure to add this one to your football party viewing menu! We start with a raw loaf of french bread that you can purchase in the refrigerated section at the store near the biscuits. The hardest part of this recipe is honestly unrolling the french bread roll after you remove it from the packaging. The trick is to look for the seam which will continue around the roll and then gently peel it back and start to roll. If you get any tears, simply push back together or you can take from the outer edges, pull the dough off, and replace where the tear occurred. Then begin layering your meat. I normally like to do my roast beef first, turkey, then ham. Top with the sharp cheddar cheese and bacon. Once you finish adding the meats, cheese, and bacon, then you start at one side and tightly roll all the way across until the entire sandwich is rolled. 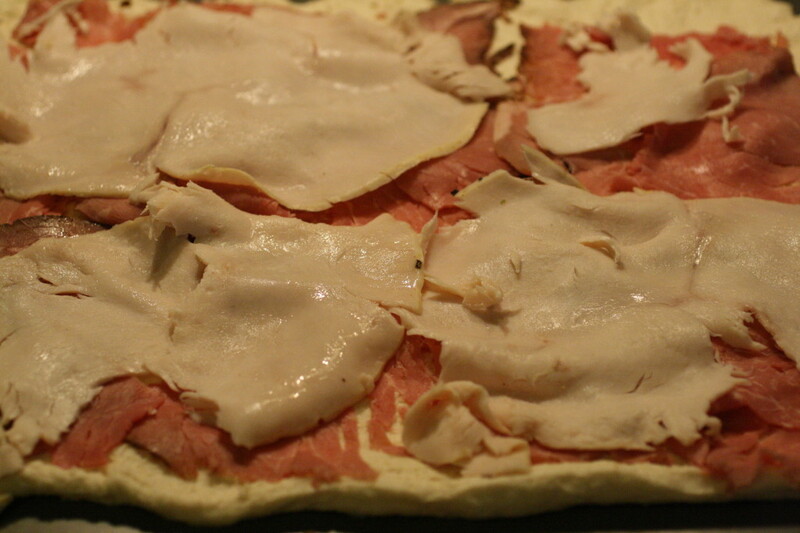 Cut 3 or 4 slits on the top and bake in the oven at 350˚ for 25 minutes. 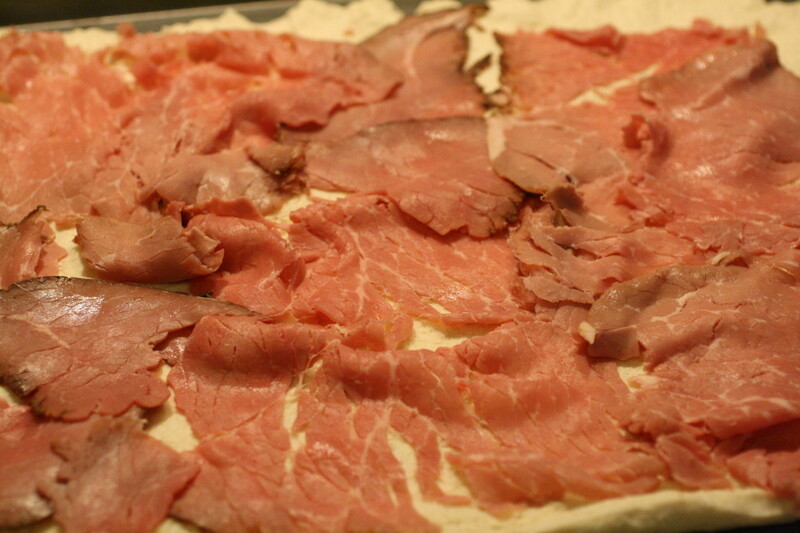 Remove and make your slices for the sandwiches and lay each piece flat. Return to the oven for 5 more minutes. These are great served with Ranch Dressing for dipping! These reheat well using the toaster oven. 2. Spray cookie sheet with non-stick cooking spray. 3. 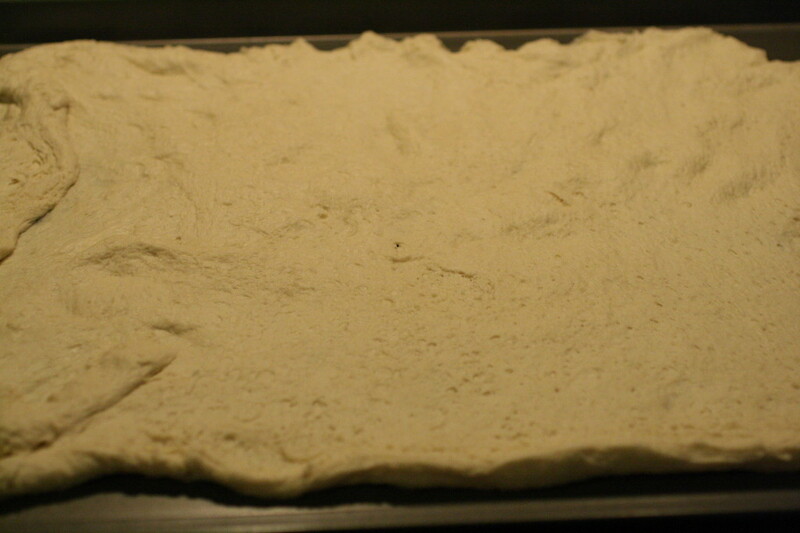 Unroll the dough carefully. 4. 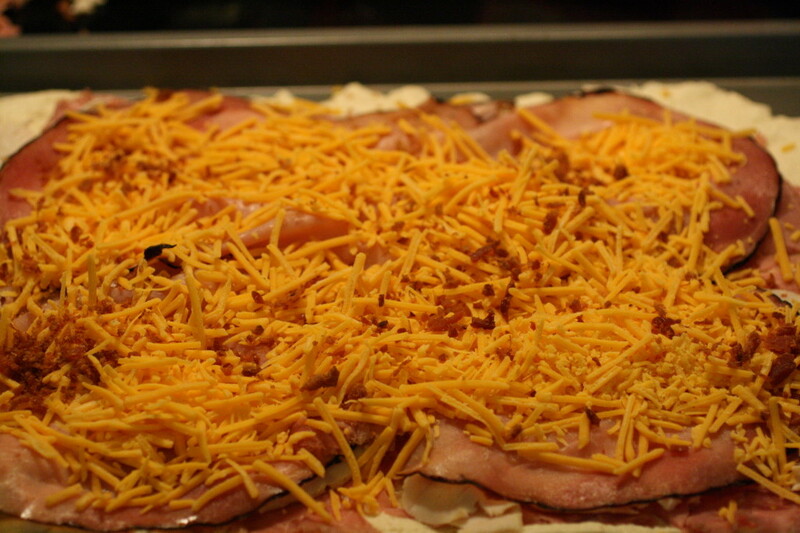 Layer the meats and finish with cheese and bacon. 5. Roll up tight and make a few slits on the top. 6. Bake for 25 minutes. 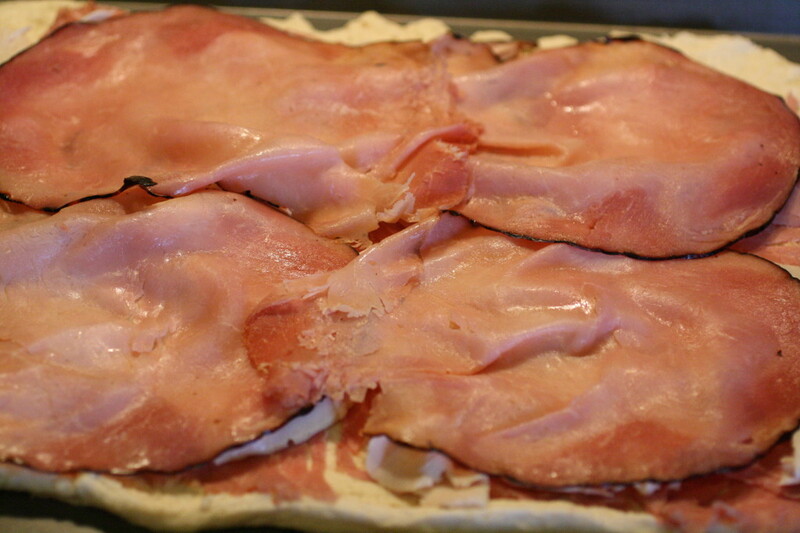 Remove from oven and make your sandwich slices. Place all pieces laying down on the tray and return to the oven for 5 more minutes to cook the dough through. 7. Serve with Ranch for dipping! Too funny…I have all the stuff in my fridge to make something very similar to this. Great minds!! Pinning it!! Oh wow! These look so simple to put together! This looks good! I don’t think I’ve seen french roll dough at our grocery store but I will look next time because my family would love this. Lisa – It should be in the section where the biscuit dough and crescent dough is. It will be called French Loaf or French Bread dough in a can. Hope that helps!